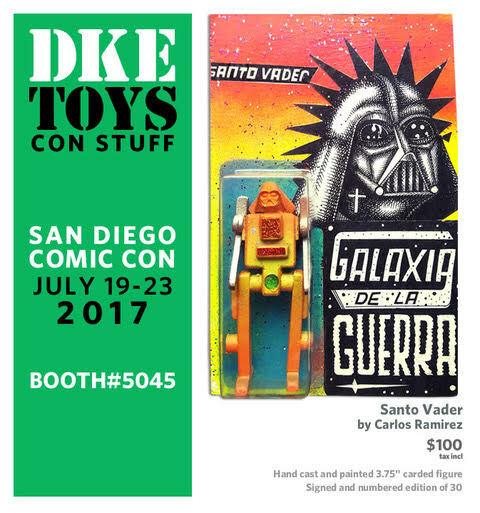 DKE Toys is releasing a crazy line-up of San Diego Comic-Con exclusive Star Wars inspired resin figures again this year at their booth #5045, and The Blot is loving the variety of awesome new figures. Check out this really creative Santo Vader resin figure by Carlos Ramirez. What’s really unique about Santo Vader is that it was first a hand made wooden figure which was then cast in resin. Ramirez then hand painted and decorated each 4” figure individually and carded them on a hand painted card back, which is cut from plywood – making each piece one of a kind! Limited to just 30 pieces, collectors can purchase this unique figure for $100.